Dentists Directory Canada-DDC > Calcium Hydroxides, Carbide Burs, Cements, Delivery, Dental Dam, Diamond Burs, EDTA Agents, Endo Surgery, Endodontic Hand Instruments, Endodontic Instruments, Endodontic Rotary Instruments, Equipment, Gutta Percha, Irrigation, NiTi Rotary Systems, Paper Points, Sealers, Topical Agents, Ultrasonics, X-Ray > Endo/Tech Inc.
Endo/Tech provides a level of service that exceeds all others. Through knowledge, honesty and respect we strive to build successful relationships. Endo/Tech was started in 1994 with the intention to give dental professionals a place to get high quality endodontic products at everyday great prices. It was a simple concept and one that has been embraced by the dental community across North America. The goal of Endo/Tech has always been to treat our customers “right”. Find the “right” products and make sure they are priced “right”, all the while providing the “right” service our customers deserve. Endo/Tech customers can feel confident that we will not influence purchasing decisions with high-pressure sales tactics, nor will we inflate our prices to accommodate hidden costs. We are here to help clinicians deliver the highest quality of care by providing and sourcing products as best we can. Endo/Tech recently celebrated its 20th anniversary thanks to our terrific customers, many of whom have been with us since our inception. 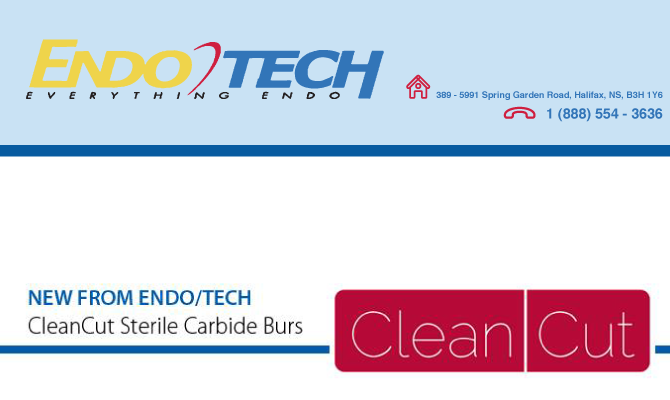 Thank you for considering Endo/Tech for your choice for endodontic supplies. Endo/Tech maintains a customized inventory based on our customers’ needs. As these needs change, we will strive to adjust our inventory to best reflect the product choices of our customers. Endo/Tech strives to ensure that all orders are shipped within one business day of the order being placed. Unless otherwise specified by the customer, Endo/Tech ships all orders using a traceable shipping method.